Ah, dear Cowpokes. If there’s one thing that remains completely reliable in the World of Woo, it’s that people will relentlessly find ways to re-invent, repackage and re-market good ol’ H20 as some kind of miracle product. For your delectation this morning, I present to you the following newspaper snippet that comes to you courtesy of the Weekend Australian and my fellow tweeps1 @johncarneyau & @DrRachie. It’s one of the cleanest waters on the planet. It’s totally pure. And it gives the food a completely different flavour. …I already know, without the need to do any further research, that the person saying it is a nitwit. Understand this, Mr Ezard: it’s not hard to make ‘totally pure’ or ‘clean’ water. Millions and millions of litres of it are created every day for one use or another. It’s done very simply: you boil it and condense it, or you filter it. THAT. IS. ALL. But of course for block-headed pretentious chefs-de-cuisine and air-headed credulous journalist gourmands, that’s WAY too prosaic. They don’t want ‘pure’ water, they want magic water – ‘2000 year old’ magic water from the bottom of the ocean, in this case. Whoa, hang on there Faithful Acowlytes – no need to bang the tin cups on the bars. Yes, water from the ocean IS salty, even if it is old. So how can it be ‘pure’? 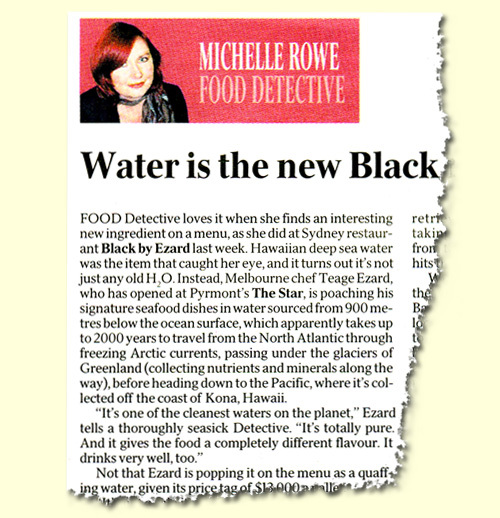 Well, to answer that question we must visit the source of Chef Ezard’s mystical water, ‘the island paradise of Hawaii’ and consult the makers of the product in question: MaHaLo Hawaii Deep Sea Water. 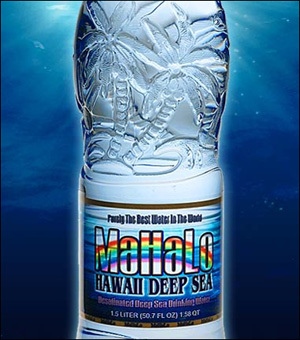 MaHaLo Hawaii Deep Sea drinking water comes to you from the island paradise of Hawaii, 3,000 feet below the ocean’s surface, where the water is naturally clean, pure, cold and filled with healthy minerals and nutrients. Aha! Naturally clean, pure, cold and filled with healthy minerals! Righty-ho, that’s easy – nothing left to do but bung it in some bottles and ship it to the customers! Koyo USA Corp. pumps the water into its ultra-modern processing facility, where it removes the excess sea salt and tests it for purity and content. Wha? They have a processing facility? And they need to remove stuff? And then do tests? So when they told us before that their water is naturally clean and pure, they meant, ‘kinda sorta’, it seems. Deep Sea Water contains abundant amounts of essential minerals like potassium, calcium and selenium, plus minute amounts of many of the trace elements such as iron, copper, zinc, manganese and chromium, which are missing from common surface water. Maybe that’s so, but that’s not what’s getting into the bottle, is it?3 What MaHaLo is asking us to believe here is that they treat water in such a way that they can remove the sea salt, make the water ‘pure’ and still maintain its supposed magical balance of minerals. I’m highly skeptical of this. What I reckon happens in the MaHaLo plant is that they desalinate the water, measure its characteristics, and then add stuff back to it. This is not rocket science, nor is it particularly special – it happens in water bottling plants all over the planet. These trace minerals help humans absorb the vitamins in food and pass these directly into the system. Actually (and I’m prepared to stand corrected on this matter) I was under the impression that it’s vitamins that help the body absorb metals and minerals and not the other way around. Whatever the case, it’s plain bunk that you need to get necessary trace minerals from drinking water; whatever you need you can get from a healthy diet. In some cases, bottled water marketed as “natural spring water” with pictures of mountain streams and lakes on the bottles’ labels is nothing more than filtered tap water. That’s right. And in some other cases, bottled water marketed as “natural deep sea water”, with pictures of palm trees and rainbows on the bottles’ label is nothing more than filtered sea water. We at Koyo USA take these deceptive claims very seriously and strive to meet and exceed EPA and FDA standards for our water. The implication here is that there is something rare or special about meeting or exceeding EPA and FDA water quality requirements – this is a wondrous use of weasel language. ALL bottled water and even normal tap water is required to meet those standards. MaHaLo should be doing more than striving – they should be guaranteeing! There is no healthier way to obtain all the nutrition your body requires from water than MaHaLo Hawaii Deep Sea® Water. Nutrition? Really? Er… actually, your body doesn’t require any nutrition at all from water. I think they’re getting confused with food. What your body requires from water is water. Counting on water to provide nutrition is almost as dumb as counting on air to provide nutrition. Just you wait until Joey and I start bottling Atlanski: Th Drinkski™. Our bottling facilities make Mahalo’s look like a sewage treatment center. At Atlanski, our facilities are Über-Modern. All I can say is that there better be a lot of impurities in that brew. I’m thinking alcohol and peat. I don’t think Joey’s gonna like the idea of putting Piet in the brew. I heard that it’s pretty hard to keep Piet OUT o’ th’ brew. Just a note, absolutely pure water is actually not that easy to get, and aside from some clean rooms (such as those used in computer manufacture) you can’t get it. And that ultra-pure water is actually not safe to drink. Any claims of clean water, or purified water scare me, because people tend to drink them in copious amounts, and get mildly sick from it. Too much purified water can throw off the ph of the body. My friend actually got dehydrated from drinking what must’ve been distilled at work one day. Crazy stuff, but true. But yes, back to the point about pure water, too pure will kill you also. We need contaminants in our water, and that’s something most people don’t realize. Yes, indeed, I do know what you’re saying about water purity is correct. Pure H20 is actually quite corrosive and is usually avoided, even for industrial applications. What you say about drinking too much purified water is possibly also correct, but the fact is that people who drink gallons of bottled water are idiots. You only need to drink enough water to keep yourself hydrated. Your body has a very good indicator system for rectifying hydration levels. It’s called ‘getting thirsty’. As everyone should know by now, the idea that you need to drink 8 litres of water a day is plain bunk. If you eat and drink sensibly, you will get all the hydration you need. Too much of ANY kind of water is bad, and, in fact, you can actually do yourself danger by over-consuming water (like over-consuming anything). The whole point is, of course, that the ‘purity/cleanness/OMG-it’s-God’s-Gift-to-humankind’ claims are just brainless. MaHaLo is holding up ‘other’ bottled waters to ridicule by suggesting that they are using nothing more than promises to sell their product, while doing exactly the same thing themselves. Maybe purified water is god’s gift to mankind. You know, natural selection and all that. Pretty soon all these people will drink themselves to death on purified water. Waterholics Anonymous will be established. The government will prohibit pure water as a drug, and underground distilleries will be set up to make it! Friends don’t let friends drink bottled water (unless it’s full of carbonation and sugar, or fermented fruits and grains!). here at the lab we manufacture our own pure water for very delicate tests because it costs an arm and a leg to buy. The purity is within some incedibly small parameters that I don’t know for sure but for it to be dangerous you would have to drink an awful lot to dilute your electrolytes into the dangerous range. Can happen though. We have those ‘breathairians’ who insist they get all their stuff by proper breathing. What shall we call these guys? “H2Oligans”? “waterians”? Imagine a hotel specially made for these guys. Here’s the thing – if you subsisted entirely on mineral and electrolyte-free water and didn’t eat anything else, you would most certainly start getting problems with your health. But my guess is that you could consume a moderate amount of distilled water along with a normal, balanced diet (including other fluids) with absolutely NO ill effects (I would welcome any further illumination on this). etc, (as MaHaLo claims), then that is indistinguishable from purified water to which you simply add those trace elements from a jar. Chemists couldn’t tell, I couldn’t tell, you couldn’t tell and Chef Ezard and Michelle Rowe certainly couldn’t tell. Let us be clear here: these people are selling a concept, not a product. The hook here is the idea that the water is somehow magicked-up by having sat at the bottom of the ocean. As for waterians, quite surprisingly there doesn’t seem to be any such cult. Breatharians are the closest you get, apparently (Breatharians are allowed water). I think we’ve discovered a rare niche in the Woo market! Well, as far as salesmanship goes, that is what folks are taught, to sell the sizzle and not the steak. An old guy by the name of Elmer Wheeler said that, and he was supposedly a master salesman. In this respect alone I have some modicum of respect for the sheer capitalism that my fine country is supposedly grounded in. I loathe salesmen, but I can’t seem to live without them. It’s our other national pastime, and has been around since we have had things to sell (buying New York state for some $25 in beads was the first real example of our excellence in selling that sizzle, making those beads out to be some tech marvel). If only they’d market the dang’d stuff as DIET. Re. non-fluorided bottled or distilled water: if you only drank pure water all your life, you would have pure putrid tooth decay like half of Europe. Most Africans or jungle dwellers have fantastic teeth without fluoride in their water because they have such a simple natural diet. But all of us Westerners have forgotten those dentures our grandparents had, haven’t we? Pure water – not for me. And unless Chef Ezard has a fondness for polishing his false teeth on his apron, not for him either. Chef Ezard is just employing a gimmick. Nothing wrong with that, but I wish he’d be honest about it. Honesty in gimmicks? That’s like truth in politics. Isn’t the idea of a gimmick that it isn’t honest? @acce245: A gimmick doesn’t imply dishonesty. For instance, one of my very favourite filmmakers, the inimitable William Castle (who I must do a post about sometime) made gimmicks his stock-in-trade. It wasn’t a matter of dishonesty – he was sincerely trying to value-add to his films. Even in the realm of haute cuisine, things like the so-called ‘molecular gastronomy’ are gimmicks, but that doesn’t make them irrelevant. Chef Ezard is not selling you anything with his use of MaHaLo water other than a magical promise: that his food will somehow taste better cooked in MaHaLo water than it would in some other bottled water. That’s dishonest. That’s sure to hit the spot. ‘Cuz why in the heck not? (You’ll know it better as ‘whisky’). What impresses me is that, according to the chef, the water “drinks very well too”. In Soviet Russia, water drinks you? Tetherd Cow Ahead is powered by	WordPress 4.2.23 and delivered to you in 0.386 seconds using 102 queries.